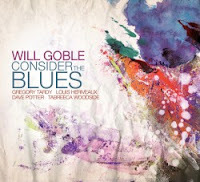 CD Review: Will Goble – Consider the Blues. Will Goble (bs); Greg Tardy (ten); Louis Heriveaux (pno); Dave Potter (dms) + Tabreeca Woodside (vcl). Another Man Gone Wrong, a traditional chain gang song features guest singer Tabreeca Woodside who brings a Nina Simone feel to this protest song. A voice ideally suited to the material. Tardy shows on tenor. However, it’s on Magic Umbrellas where Tardy shows that he’s anything but tardy when it comes to dealing out a mind-blowing tenor solo! I found myself standing up and clapping even though I was the only one in the room! I don’t even do that for Bird, Diz, Frank, Ella or the rest of the gang! Jazz, the sound of surprise as always. Greg’s on my list when the next DB Poll comes around. You wait for an hour then three come along at once. This might seem to be the case with Gerry Richardson's Big Idea - but aren't we glad we waited?! 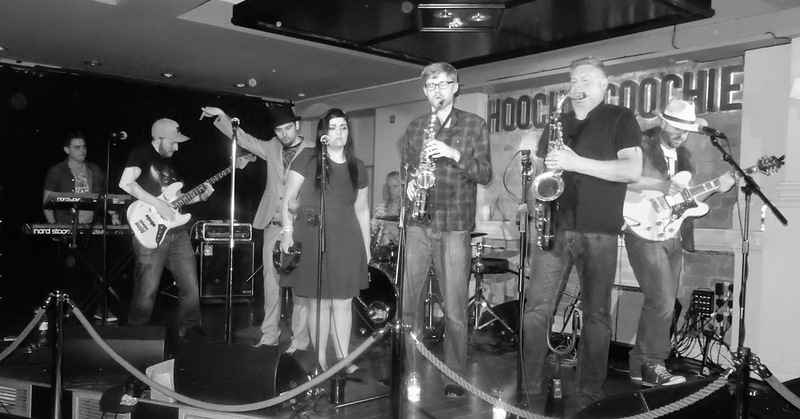 After a hiatus of several years, the Big Idea became a good idea again popping up at Hoochie and the Jazz Café. They are back at the latter venue this Thursday June 2. If you caught this (I quote) Hammond Organ led nine piece Funk, Latin, African and straight ahead swing powerhouse. Lyrical altoist Garry Linsley lines up alongside acclaimed saxophonists Sue Ferris and Stuart Johnson, while the brass section of Gordon Marshall, Dave Hignett and David Gray pack a punch worthy of Muhammed Ali. 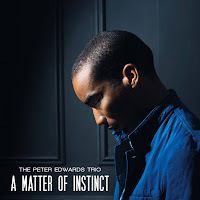 Guitarist Rod Sinclair is a virtuoso at home in everything from classic jazz to R'n'B, while the whole ensemble is driven relentlessly forward by the leader's dynamic work on the Hammond Organ and Adam Sinclair at the drums. 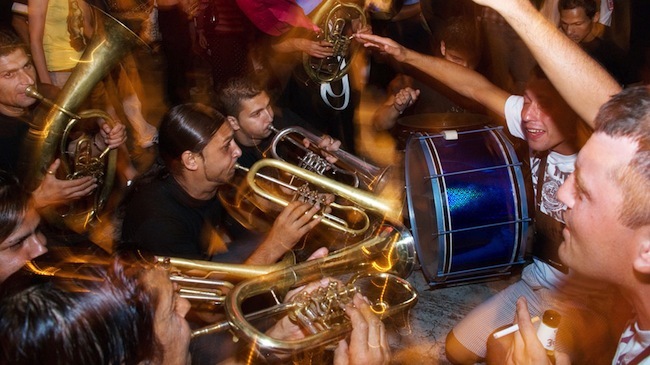 (unquote) band then you will know what to expect - or will you? I'm told there are new charts in the pad. If you are new to the experience - don't miss it. You might find me dossing in the doorway just to be sure! 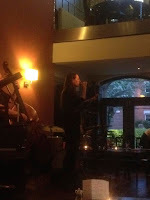 Thursday June 2, Jazz Café 8pm. £6. 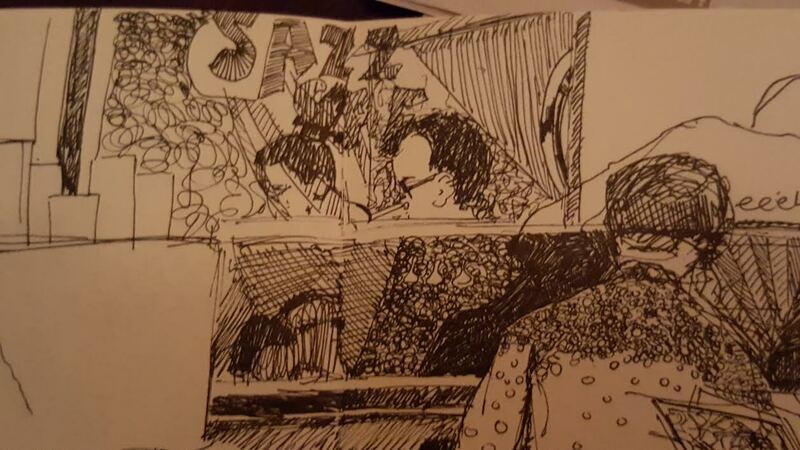 One of the things I like about the Jazz Café is that those who are really into it can sit around the band while those with less, though not necessarily no, interest can sit further afield and dip in and out as the mood takes them. Anybody who saw the recent Maigret with Rowan Atkinson will have noticed that the Jazz Café setting in Paris was very lively and noisy which is how it will have been in the mid-fifties. I don't understand why we always have to follow classical music which, I'm told, is moving away from the reverence of yesteryear. When I took my kids, aged 7 and 8, to see Haydn's Nelson Mass to celebrate the bicentenary of Trafalgar in 2005, they became a little fidgety attracting a few disapproving glances. Shortly after we saw Djangology at Masham Town Hall and, while their behaviour was excellent, a lady on the next table was positively rude. Last November, at the London Jazz Festival, Saturday Night Fever was provided by the Average White Band and fellow (Jazz) Funk band Kokomo, featuring guitarist Jim Mullen. Although I enjoy Sage Gateshead's Americana Festival (July 22-24 this year) I'm not an out and out Country fan. However, when the this came on the jukebox in my local Honky Tonk I thought it worth sharing. Lance. Alice Grace resumed with Beautiful Love – great tune. The Long Road, a Grace original, perhaps owed something to the Winstone/Wheeler sound, a sound Ms Grace gets so well and improvises on it. 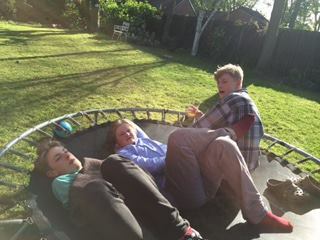 Alice Grace (vcl); Peter Gilligan (pno) + Pete Tanton (tpt). The Jazz Café was crowded, as was Wembley Stadium earlier. Taking into account the difference in size and numbers between the two venues, on a decibel per person basis the Caff audience was relatively noisier than the Hull fans were when the 'Tigers' scored the winning goal! Harry Potter and a Quintet On Fire - The Sue Ferris Quintet @ Ushaw College, Friday, May 27. Sue Ferris, tenor sax & flute, Graham Hardy, trumpet & flugelhorn, Paul Edis, piano, Andy Champion, bass and Rob Walker, drums. Walking around inside Ushaw College you feel as if you have inadvertently wandered into a Harry Potter movie: the whole complex is impressively Neo-Gothic with much of the interior work designed by Pugin (of Palace of Westminster fame); a huge wall adjoins the main buildings constructed, apparently, for the sole purpose of playing “Cat”, an arcane ball-game like a prototype Quidditch and even the lengthy stroll to the toilets (everything here is on a grand scale) is via an “ambulacrum” with mullioned windows looking out over a grassed quadrangle. Academy Stars - The Early Bird Band. 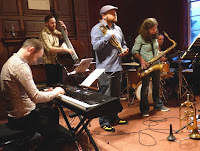 Ben Lawrence, trumpet, James Metcalf, trumpet, Paul Edis, MD & alto, Francis Tulip, guitar, Philip Grobe, piano, Dan Lawrence, bass and Matthew McKellar, drums. Durham County Cricket Club has problematic finances, struggles to get the crowds it needs, misses out on the share of national acclaim it deserves and yet the standard of cricket is second to none. Twice champions recently and flying again this year while fielding teams almost entirely of local talent nurtured in their excellent academy. Jazz in the north-east is very similar: the playing is second to none; the area surely punches above its weight compared to other provincial regions and there is a conveyor belt of young talent, as seen here tonight, promising a continuation of that excellence! 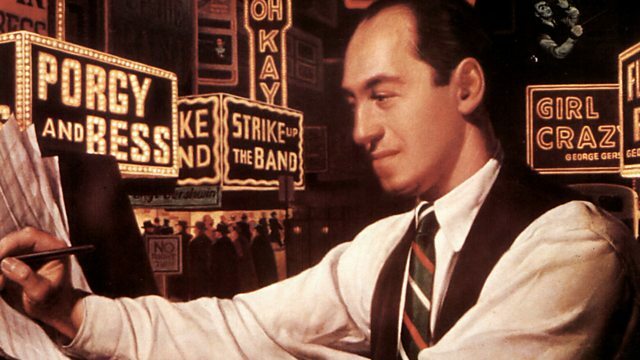 BBC Radio 3’s Composer of the Week programme (Monday-Friday 12 noon, repeated 6:30pm) profiles George Gershwin, starting Monday 30 May. 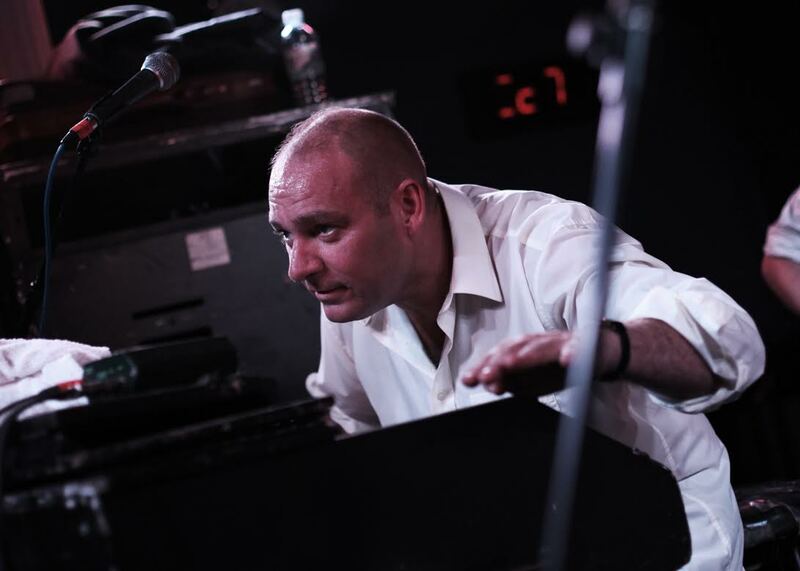 The James Taylor Quartet, who have set the standard for the coolest sounds in acid jazz for over a quarter of a century, are coming to Gala Theatre on Saturday 4 June at 7.30pm. James Taylor, one of the greatest British instrumentalists of his generation, has taken his trademark howling Hammond organ sound to the masses since the 1980s. The quartet have produced a bulging catalogue of remarkable albums and show-stopping gigs that continues to see them in hot demand everywhere from Ronnie Scott’s to Rome. There was a full house today at the Lit and Phil for a return engagement of one of the region’s finest pianists. Dean Stockdale played a one-hour trio set in the company of Mick Shoulder and Adam Sinclair. A programme of standards and no fewer than four compositions written by Stockdale deservedly won rapturous applause. Preview: Riviera Quartet @ The Globe - June 9. 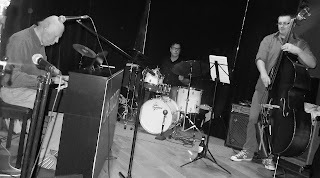 Pete Tanton has sent me a link to a rehearsal by the Riviera Quartet in advance of their Jazz Coop gig at The Globe on June 9. 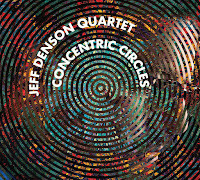 The quartet comprises Pete on trumpet and flugel, Mark Williams, guitar, John Pope, bass, and Russ Morgan on drums. Paul Skerritt: New York! New York! Today marked the launch of this year’s summer season of direct flights from Newcastle to New York. BBC Newcastle broadcast live from Newcastle International Airport just minutes before the first flight took off for the Big Apple. Vocalist Paul Skerritt could be heard entertaining those lucky passengers prior to boarding singing New York, New York. The question is: Did Skerritt run across the tarmac and take his seat on board the Boeing 757-200? Peter Edwards (pno/Rhodes); Max Luthert (bs); Moses Boyd (dms). CD Review: Johnny Hunter Quartet - While We Still Can. Johnny Hunter (dms); Ben Watts (ten); Graham South (tpt); Stewart Wilson (bs). Johnny Hunter isn't just an A-list drummer but he's also a composer laying to rest the old '3 musicians + 1 drummer = 1 quartet' joke. 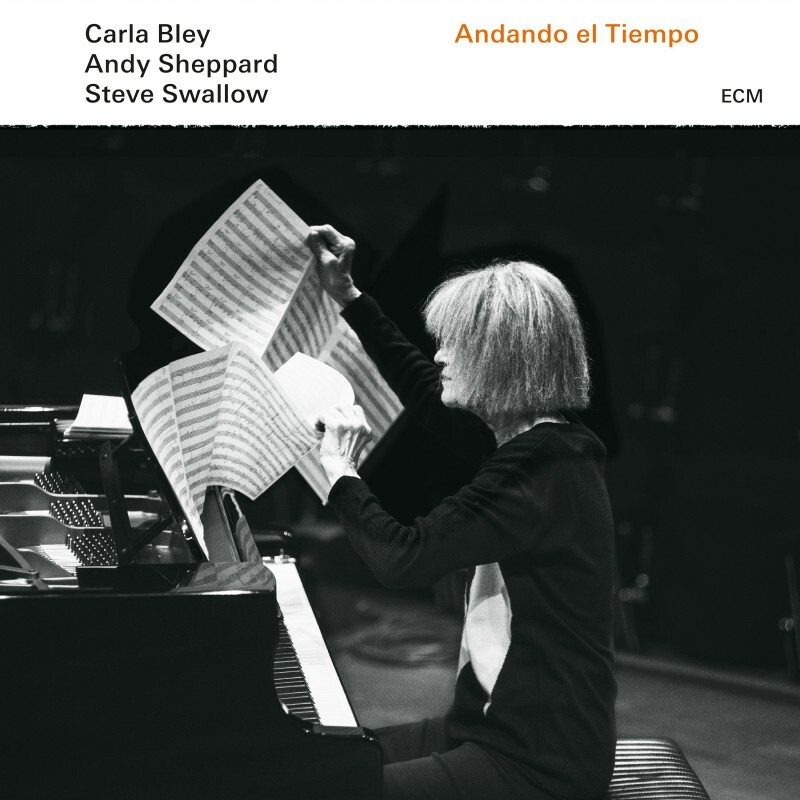 This is perhaps more ambitious than previous recordings - quote: “For a while, I've been fascinated by the music of the Middle East and have found many similarities with contemporary jazz - with this album I wanted to explore some of the traits which draw me to it. 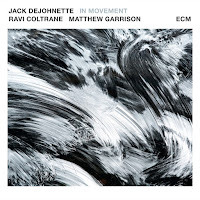 CD Reviews: Jack DeJohnette, Ravi Coltrane and Matthew (son of Jimmy) Garrison - In Movement. Carla Bley, Andy Sheppard and Steve Swallow - Andando el Tiempo. When I was offered a pair of ECM albums to review I declared upfront that I have a love/hate relationship with the label. I generally hate them but occasionally stumble across one I really like. Lightweight and boring, meaningless meanderings and pointless doodling claim the no camp, but believers, who like the European classicism, will point out that it's all done with incredible taste, which could be a contradiction in terms. One of the best things about the new (chaotic) road system around the Central Station and Pink Lane is that a taxi can now drop you off directly outside the Jazz Cafe and there is always something exciting about stepping out into a crowded noisy street and hearing sounds of jazz floating on the air. Opening the door to the Cafe the music hit straight away as the band were in full flow. As the reviewer says Friday nights at the Cafe have become the place to be and this was a top-notch group, playing at the top of their game. The whole session was great and it was a real buzz to be there. 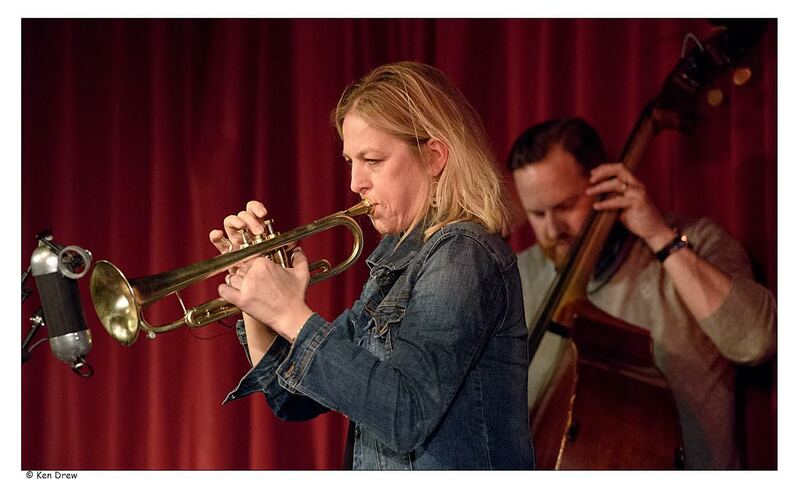 Canadian trumpeter Ingrid Jensen is the first featured artist for the new northern jazz network (Norvoljazz) international touring scheme. We are delighted to feature Ingrid as the first featured artist . 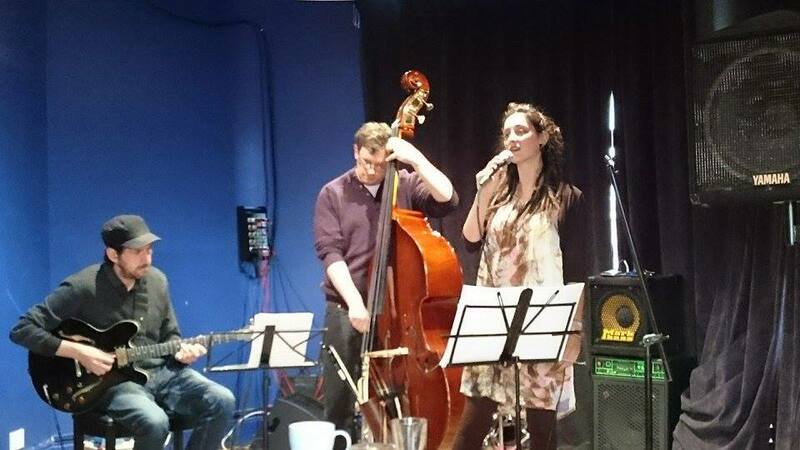 Ingrid Jensen will be joined by three stellar UK musicians – Jez Franks on guitar, Andy Champion on double bass and Tim Giles on drums. 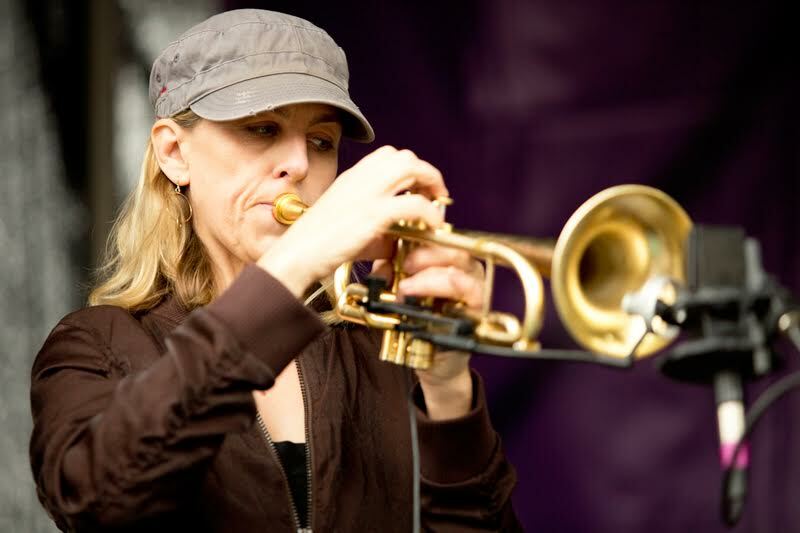 In addition to the quartet tour dates, Ingrid will also appear as a guest soloist with Colin Byrne’s Leeds Jazz Orchestra, lead masterclasses with the National Youth Jazz Orchestra and will close her time in the UK with a one-off performance at Ronnie Scott’s in London featuring the Engines Orchestra. 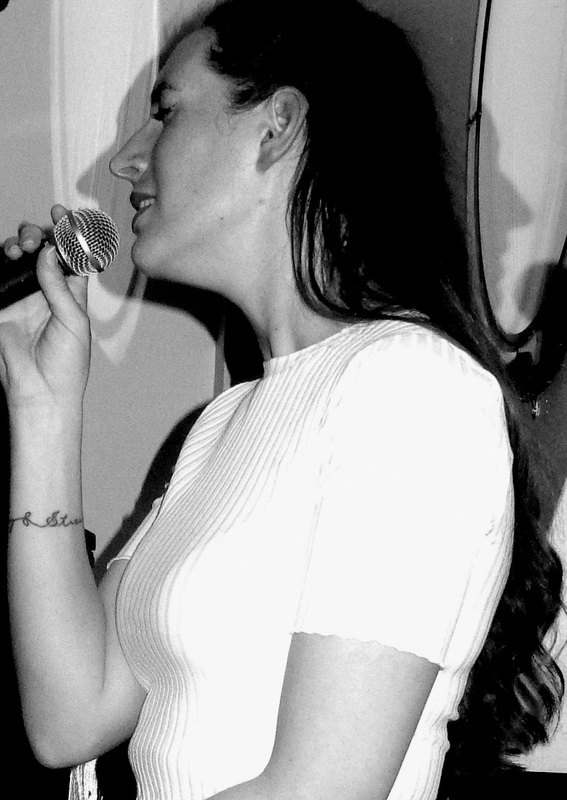 That delightful songbird, Claire Kelly, currently plying her trade in Malaysia and Thailand, is returning to the north-east for a 9-week sojourn from mid-June to August and is keen to get in a few jazz gigs during that period. Claire appeared at a Jazz Coop gig at The Globe last year and was in fine voice as Ann Alex's review noted. Franco’s Birthday..A Night He’ll Never Forget…Or Remember! My phone rang. “Hello Scott. This is Franco [Valussi]!” Well I already knew it was Franco because even though he speaks perfect English, he does so with an Italian accent, which is quite common from what I understand if you are born and raised in Italy. Another reason I knew it was Franco is because he is the only person in the world who has my Hong Kong phone number, so that narrowed down the options as well. Franco in a somewhat shattered voice informed me that there was no way he was going to make the job this evening. Hell, I knew that the night before! 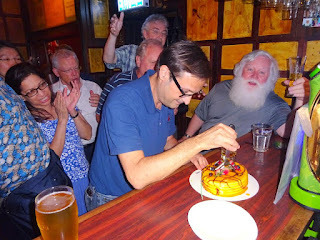 It was Franco’s birthday. He lives here on the Island of Peng Chau as well and got me set up in the apartment I’m now staying at. We meet at 8:20pm at the ferry for the 8:30 boat into Hong Kong, and within 45 minutes I’ve gone from this wonderful tropical island, to standing at the bar being served my first of the evening by Anita, who pours with a steady hand and a smile. For myself, I simply walk out the door and the ferry is three minutes away. Franco, who lives about a half a mile or so, rides his bike to the ferry and leaves it there with the other 100 bicycles or so that sit near the docks waiting for their owners to return. I wished Franco well and told him I hope he would be feeling better soon. Then I hung up and was getting ready for a refreshing shower before the nightly binge. Daryl Burns/Kerry Green (vox); Dan Smith (alt); Mark Sykes (ten); Dave Wasp (gtr); Liam Gaughan (bs); Jamie Toms (keys); John Musgrove (kit) + Ruth Davy (vcl). The frenetic and mass produced sameness of the restaurants and bars on Osborne Road in Jesmond has been a mainstay of Newcastle nightlife for a bit too long in my view. The noisy and youthful hordes that gather there at weekends bring to mind Dorothy Parker's remark while observing a debutante's ball in Yale that 'If everyone in this crowd was laid end to end...I wouldn't be at all surprised'. However, for more than a few years now there has been one oasis of great food and music at the city end of the street, the Cherry Tree restaurant, which is just far enough away from the mayhem further up the road to allow one to forget its existence. Lindsay Sings the Blues @ Gala Theatre, Durham. May 20. Lindsay Hannon (vcl); Mark Williams (gtr); John Pope (bs); Russ Morgan (dms). 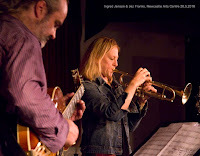 (Review by Steven T/photo courtesy of Brian Ebbatson). It was number one son suggested I review this - don't you just loathe them - and, since I don't recall reading one for this regular event, though I know they've been done in the past, I figured it's overdue. It's another event in Durham that's doing just fine thank you very much with, a rough calculation, ninety-five souls in the afternoon sunshine with a glorious view of the train station and Wharton Park. I knew they'd love this one; they're a predominantly older crowd of not necessarily Jazz buffs who like nothing better than a good singer, some good songs and a good band. A warm, sunny, evening, a piano legend with his ace trio, Wylam Gold Tankard on draught, in a perfect world, the Globe was the place to be! Sadly, we don't live in a perfect world. I couldn't believe such a poor attendance for such a great trio. Downstairs, The Palominos pulled, upstairs the Alan Glen Trio didn't. It doesn't happen very often but when it does it's like all your birthdays rolled into one! 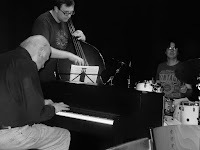 By which I mean a rare appearance by the Alan Glen Trio who show at The Jazz Coop's HQ - The Globe in Newcastle tonight. Alan has been playing modern jazz piano longer than most other pianists and, it has to be said, nobody does it better. 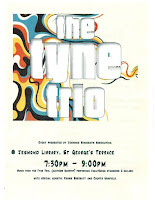 Tonight, with John Pope on bass and Paul Wight (or is it Syd White?) on drums the Globe will be witnessing music from a northeast piano legend - a grandmaster of jazz. Doors 7:30pm. £5. 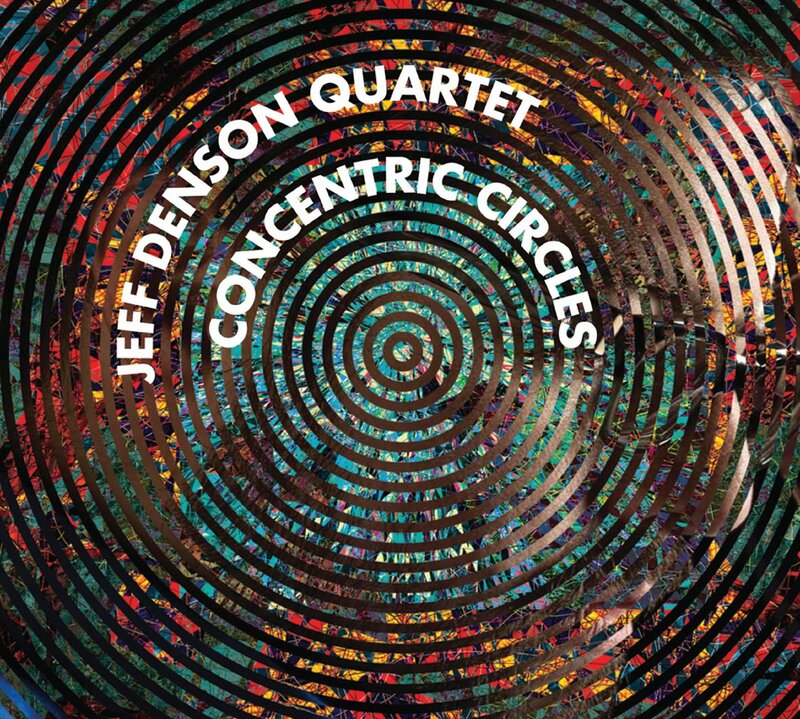 Noel Dennis Trio @ Jazz Café - May 20. 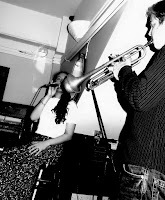 Noel Dennis - trumpet, flugelhorn. Paul Edis - piano. Andy Champion - double bass. It was a tough choice, Blaydon last Sunday or Jazz Café tonight. I'm a known philistine for my preference for bands with drums, but Friday night at the Caff has become a regular part of the routine. Man pneumonia intervened and the Caff won out. I was sat with an American couple from Oregon and Hawaii, now resident in Newcastle, who weren't sure whether to stay or not. She was grinning from the start but he held out until Andy’s' first big solo when pleasure burst out all over his face. I know you're not supposed to have favourites, he told me afterwards. He's a bassoon player and music student and she's a conservation scientist, which means she tries to prevent the deteriation of art - a bit like the band I suppose - and she drew a picture of them while they performed. (Review by Russell/Photo courtesy of Ken Drew). A busy Friday evening at Sage Gateshead – the Royal Northern Sinfonia in Sage One, the soulful Laura Mvula playing to a standing-room-only crowd in Sage Two and the Anglo-Norwegian project of Thomas Strønen and friends in the Northern Rock Foundation Hall. The cabaret-style layout in the flexible studio space of the Northern Rock helps engender an informal air, making the connection between performer and audience more immediate. Percussionist Thomas Strønen’s Time is a Blind Guide project recorded an album a year or so ago and it is only now that the musicians were able to commit to a short tour such is the busy schedule of all concerned. 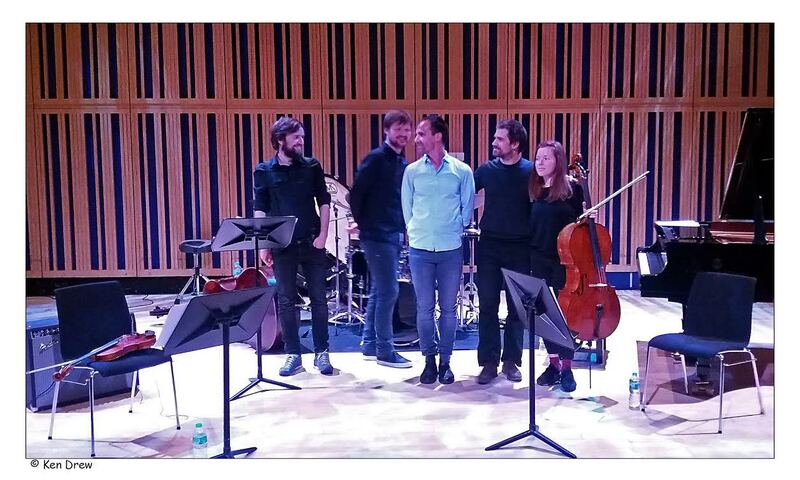 This Sage Gateshead date, the first of four concerts in four days (London, Birmingham and Norwich to follow), renewed Strønen’s connections with the Borough of Gateshead. BABMUS…an amalgam of Sage Gateshead’s BA and BMus student degree courses. 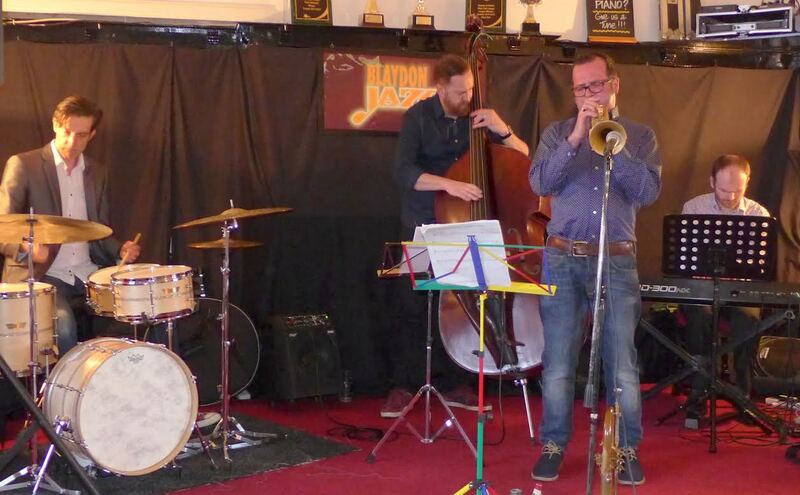 One or two familiar faces – percussionist Michael Mather has been known to sit-in at Caff jam sessions and Stephen Hall (electric bass) has performed at Sage HQ – took to the stand as members of an eleven piece band in the upstairs room of the Jazz Café. 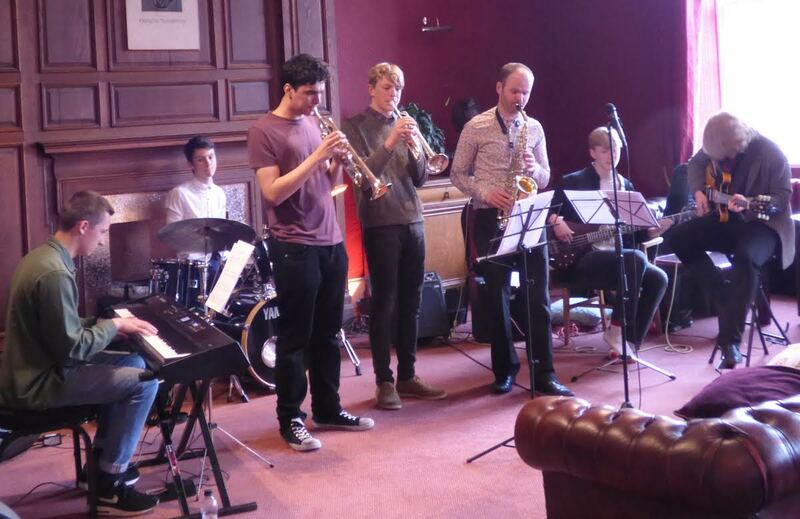 Nine students and two senior practitioners – MD Paul Edis and guest Sue Ferris (tenor saxophone) – played two sets of familiar tunes to a healthy turnout of enthusiastic supporters. Tom O'Grady (keys/Rhodes); Alex Hitchcock (ten); Tiago Coimbra (bs gtr); Ric Elsworth (dms). Resolution 88 came on with all guns blazing. Think Herbie Hancock, Headhunters, decibels - particularly decibels! This was the heavy metal end of jazz funk and it took some adjustment before my mindset became attuned. The funeral arrangements have been finalised for Judith Moore who passed away on May 9. Judith loved music and in her younger days was a regular at such north east venues as the New Orleans Club, the Club Agogo, the Downbeat, the Corner House and, in later years, Hoochie Coochie and the Jazz Café. Sadly, failing health meant Judith had been absent from the scene in recent months but she will be remembered and deeply missed by all who knew her. The funeral is on Thursday, May 26 - 10:30am at Saltwell Crematorium, Gateshead. Chronicle/Journal notice. 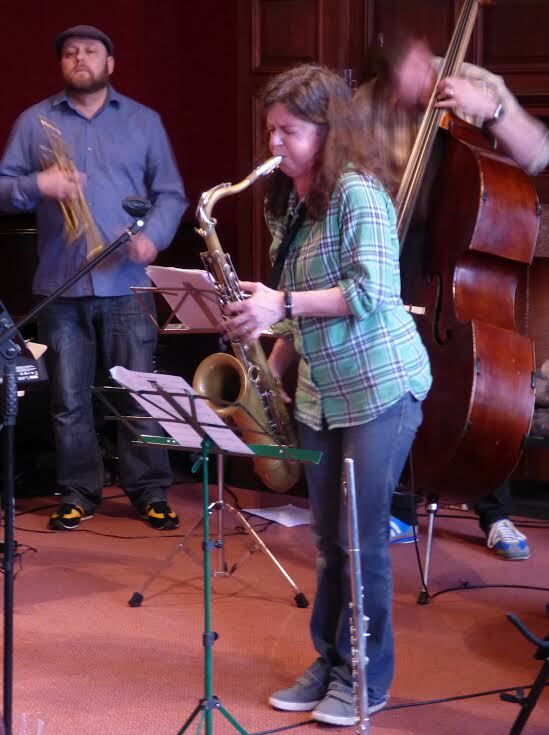 Pete Gilligan (pno); Katy Trigger (bs gtr); Russ Morgan (dms) + Johnny 'Blue Hat' Davis (ten); Charles Harrison (gtr). Sometimes, less can be more and such was the case tonight. For once the jammers weren't standing ten deep at the bar, jostling for position. Sticks twirled, reeds moistened, mouthpieces warmed the owners awaiting the signal from maestro Gilligan telling them that they were on next. 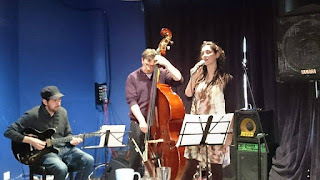 Instead, the trio played a longer first set with Katy Trigger on bass guitar standing in for Paul Grainger. The girl did good, her sound rich and undistorted; her solos meaningful. 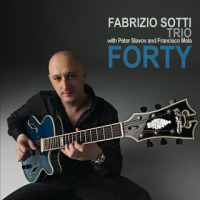 Fabrizio Sotti - Guitar. Peter Slavov - Bass. Francisco Mela - Drums. Sotti has previously mixed genres working with a variety of artists including Ice T, Cassandra Wilson, Shaggy, Zucchero, Tupac, Whitney Houston, Randy Brecker, John Patitucci and Al Foster. For a little local colour he played with David Knopfler of Dire Straits. The title of the new album from New Yorker, by way of Italy, indicates his age and a new beginning with a change of direction to a basic Jazz guitar, electric bass and drums trio featuring nine originals and a cover of the Antonio Carlos Jobin favourite How Insensitive. 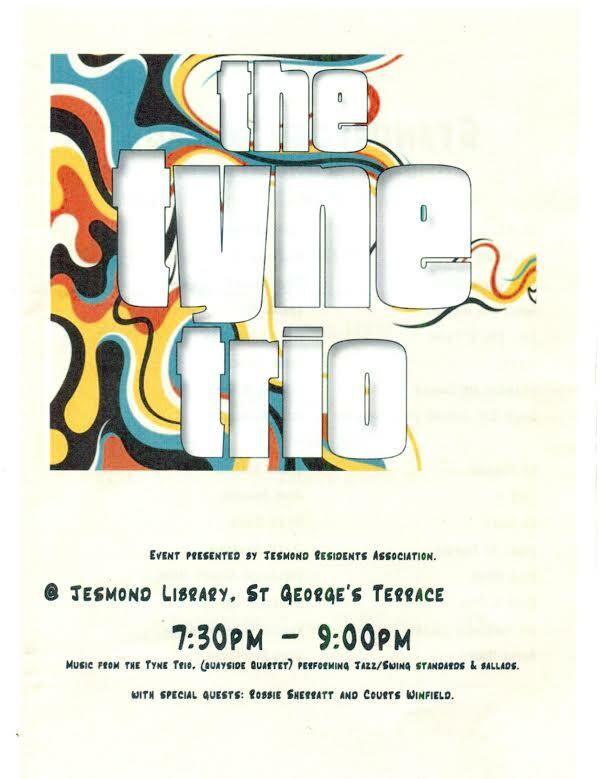 The Tyne Trio, the Quayside Quartet, the Jesmond Sextet. An ailing, absent vocalist, the plot thickens. 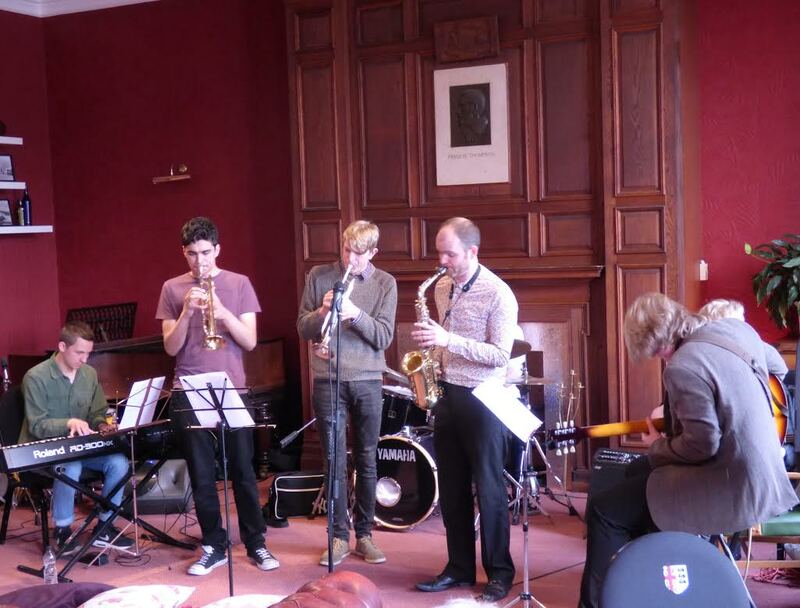 The core trio, formed in 2015, consisting of Newcastle University students Charlie Philp, guitar, Joe Reeve, saxophone and bassist Bev Morris, put together a sextet for this second evening of jazz at Jesmond Library during this year’s Jesmond Residents Community Association Festival. 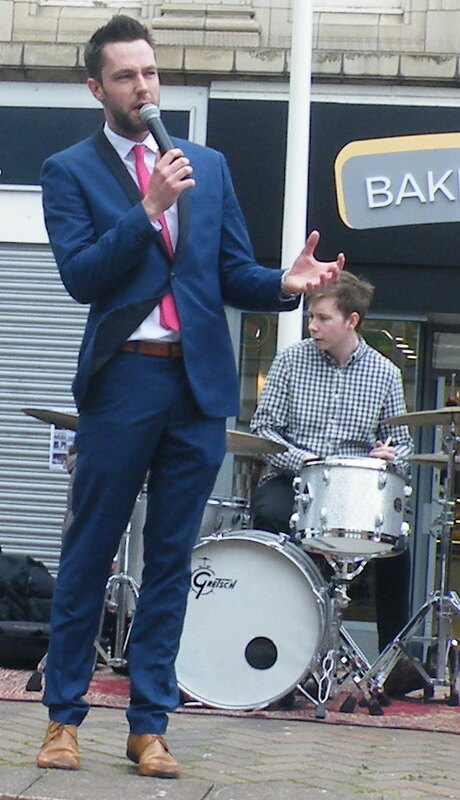 Alto saxophonist Dominic Lodge took the drum chair, thus the quartet, known as the Quayside Quartet, represented two-thirds of the musicians on the stand. The trio and quartet work the function circuit across Newcastle and for this public concert performance drafted in friends Robbie Sherratt, violin and keyboards man Courts Winfield to present two sets as a sextet to another sizeable festival gathering. CD Review: Benet McLean - The Bopped and the Bopless. 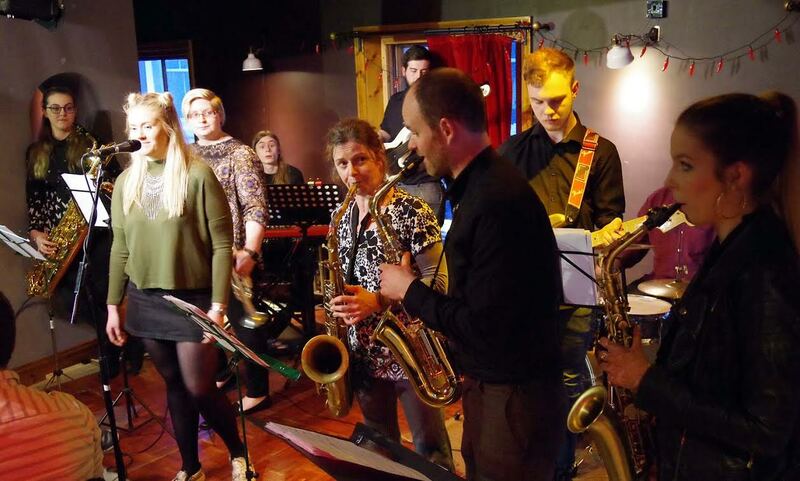 Benet McLean – piano/vocals/violin; Noel Langley – trumpet; Aydenne Simone – vocals; Jason Yarde – ; saxophones ; Gareth Lockrane – flutes; Duncan Eagles – saxophones; Ashley Slater – trombone; Isabella Maria Asbjornsen – harp; Donald Gamble – percussion; Jonathan Harvey – bass; Saleem Raman – drums. 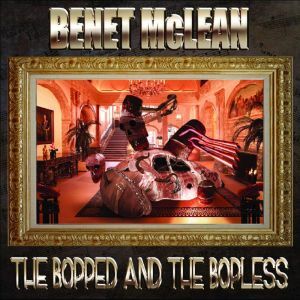 The Bopped and the Bopless could easily be The Hipped and the Hopless! Not that I’m complaining, far from it. This is as fine an example of cross-gendering as you’ll find in a long day’s pogoing across the great divide. Suddenly the divide doesn’t seem that great! Take a look at the players involved – jazzmen to a core, albeit with their own tributaries that they occasionally sail off on, and they do the business here. That was ‘Blue in Green’. We’ve come to our last number this evening, but first…Herbie Hancock [applause], Ron Carter [applause] and Tony Williams [applause]. We hope you have enjoyed your evening here at the Blue Note, we’ll leave you with ‘Now’s the Time’. The following day’s New York Times: Miles Davis – triumphant at the Blue Note! That was ‘Blue in Green’. We’ve come to our last number this evening, but first…Paul Edis [applause], Andy Champion [applause] and Russ Morgan [applause]. We hope you have enjoyed your evening here at the Black Bull, we’ll leave you with ‘Now’s the Time’. I have a music video project being filmed on Saturday (May 21st) where I require brass players with a particular alternative look, aged 20s/30s! As I am also getting particularly desperate here I am considering trying to hire instruments and have my friends pretend to play them. I would prefer real players, but I’ll take anything at the moment to make this happen. Buster Cooper, one of the last of the great Ellingtonians passed away on Friday, May 13. The trombonist was with Duke for most of the 1960s appearing with the band at Newcastle City Hall on at least two occasions (1965/67). Like all of Ellington's soloists, he had a very distinctive style that varied from boisterous humour to romantic lyricism. 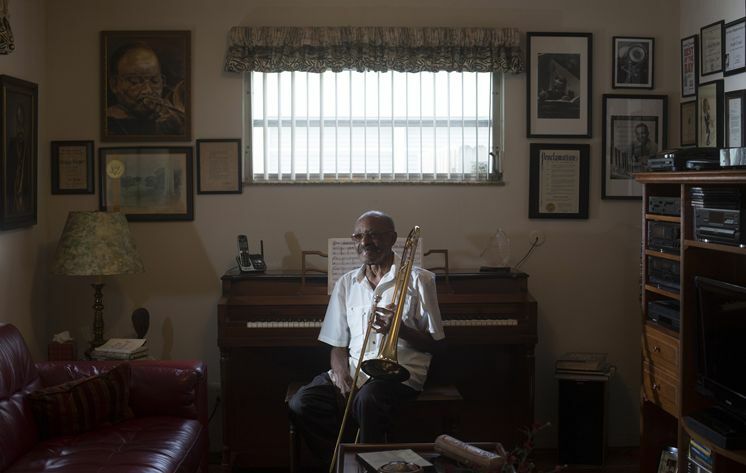 Prior to joining Ellington, Cooper had a spell with Lionel Hampton and in later years with the Frankie Capp Juggernaut. 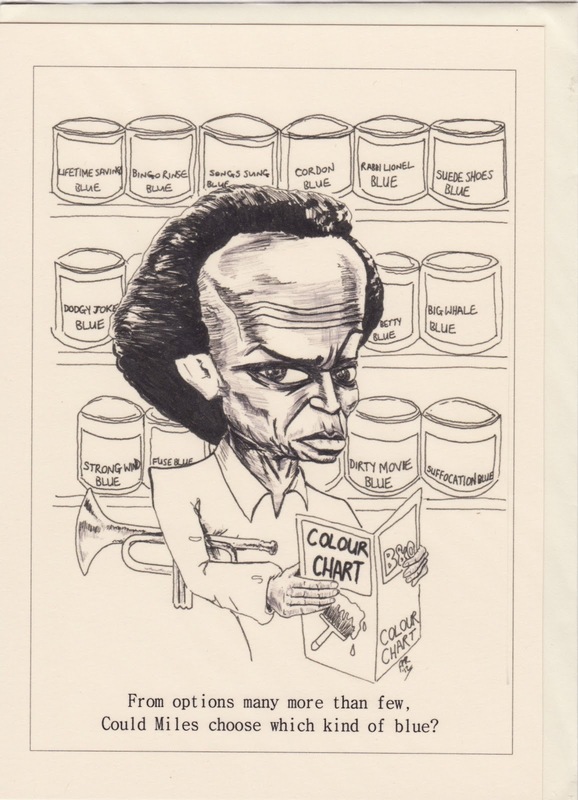 Although 87 when he passed away he was still gigging up to February this year. Early Birds Band @ Lit and Phil - May 14. Paul Edis - alto, piano, MD. Ben Lawrence - trumpet. Nick Caughey - tenor. Francis Tulip - guitar. Dan Lawrence - bass guitar. Mathew MacKellar - drums. James Metcalfe - trumpet. Phil Grobe - piano. With none of the mainstays there, it's fallen to me and my extended, misspent youth impaired memory to report on the latest offering from Dr. Edis and his young hopefuls. 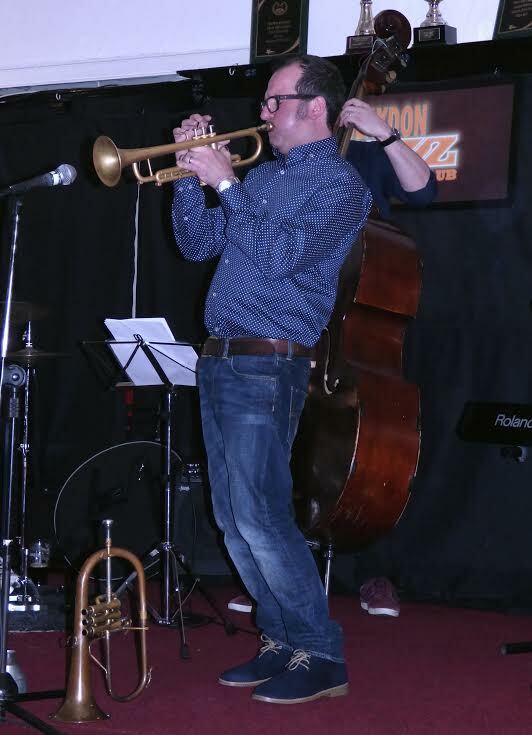 With the approaching departure of a couple of members he's added James Metcalfe on trumpet and Dr. Phil on piano, perhaps to replace Francis on guitar and to free up Paul to further beef up the horns. Jeff Denson (bs/vcl); Paul Hanson (bassoon); Dan Zemelman (pno); Alan Hall (dms). I don't recall many if any, jazz discs where the frontline horn is a bassoon. There's been the occasional oboe (an ill wind that nobody blows good!) that failed to make the earth move for me so I didn't rush to slip this one into the player. WTF is a bassoon anyway? I worked in a music shop for 30 years and I can count the number of bassoons we sold on one finger. So as I say, I approached this one with mucho trepidation only to discover that, in the hands and lips of Paul Hanson, the bassoon can hold its own in any setting. 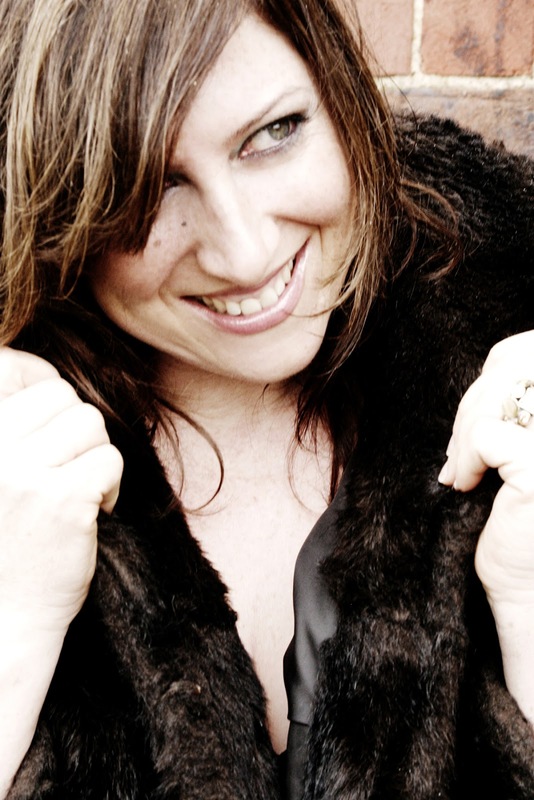 Anita Wardell @ The Globe - May 14. Anita Wardell (vcl); Robin Aspland (pno); Paul Grainger (bs); Tristan Maillot (dms). The old adage that "Those that can do and those that can't teach" didn't apply here. Ms. Wardell does both better than anyone around, as any of the students who attended this weekend's jazz vocal course at the Globe will attest to. Indeed, if only 50% of her talent rubs off on those aspiring singers some of the more established names will soon be looking over their shoulders. The Jazz Coop's HQ was understandably crowded although it has to be said that, with a couple of exceptions, the north-east 'jazz faithful' were prominent by their absence. Guitarist Simone Gubbiotti arrived at the Jazz Café to play a final date of a British tour. In fact, this Newcastle appearance was an extra gig at the end of a tour of Scotland. The Umbria-based Gubbiotti arrived with an impressive pedigree; Berklee student, gigs and recording dates with luminaries such as Peter Erskine and a current deal with Dot Time Records. 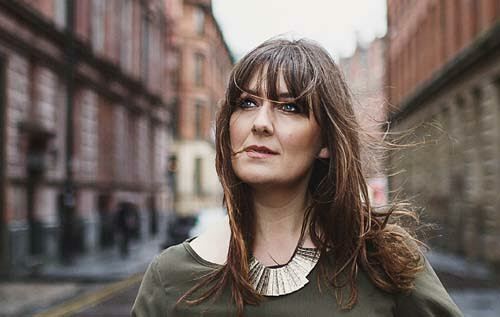 Preview: Anita Wardell @ The Globe, Newcastle - Tonight (May 14). A very rare visit by this top jazz vocalist to Tyneside. 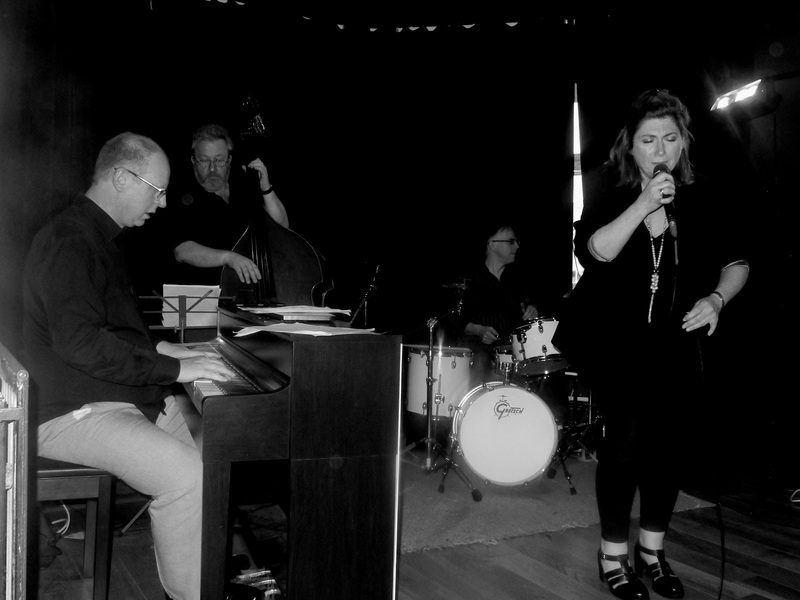 Anita Wardell - vocals, Robin Aspland - piano, Paul Grainger - bass, Tristan Mailliot - drums. If you're a singer and you ain't got no gig tonight you'll need a sick note to be excused! Inexcusably unmissable! CD Review: Sari Kessler - Do Right. Roy Ayers @ Sage Gateshead - May 12. More Discs to Die For. Roy Ayers preview Sage 2 Thursday May 12. Budtet @ The Globe - May 7. CD Review: Louis Heriveaux - Triadic Episode. Cheers for the Jazz Coop. VEIN w. Greg Osby @ the Lit & Phil - May 4. 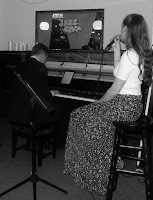 Jazz Café Jam Session - May 3. Where Has Ann Alex Got To? 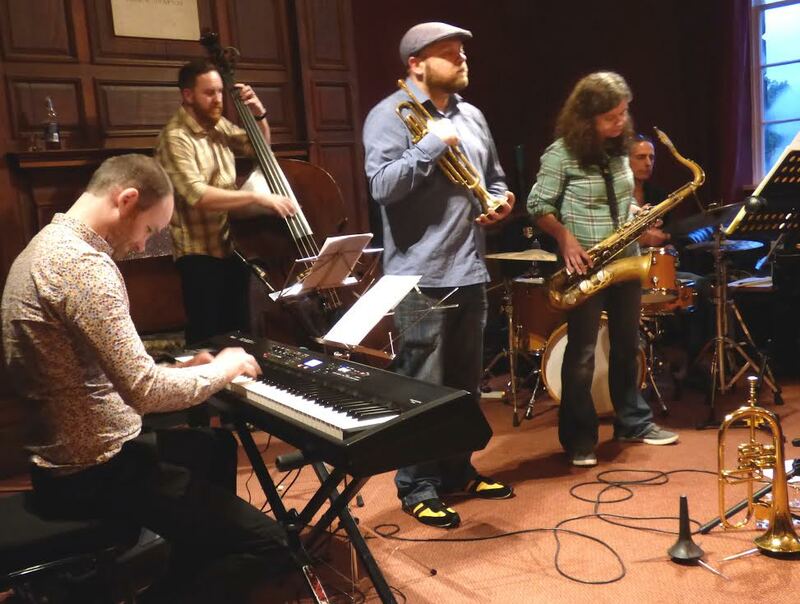 CD Review: Tony Lustig Quintet - Taking Flight.